In baseball, springtime is the season for the hopeful. Players, coaches, managers and front office personnel gather in Florida and Arizona, looking for the hidden gems, the rising stars and the heretofore unknowns that make their mark and take their adoptive city by storm. This was no different in Maryvale, Ariz., in February, 2014, as the Milwaukee Brewers gathered to prepare for another season. What none of them saw coming was that their breakout superstar, media darling and rallying force was already there among them. That’s because, at first, none of them thought to look down. He first appeared at the security gate at Maryvale Baseball Park on Feb. 17, 2014, dirty, hungry and clearly without a home. 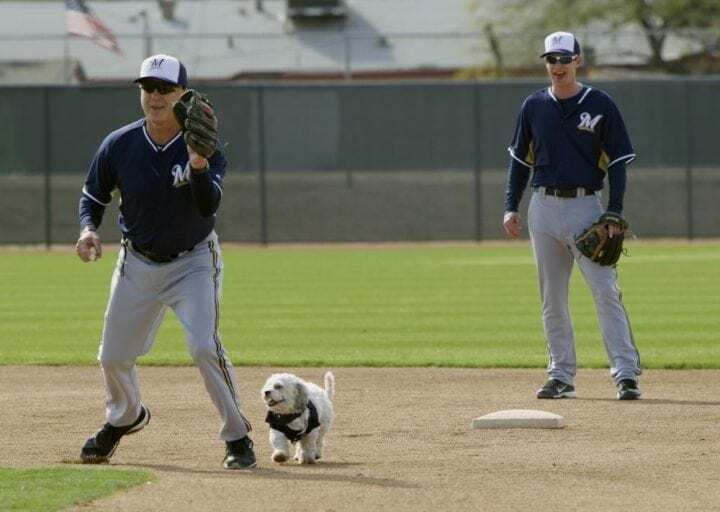 On this day, the Milwaukee Brewers were about to take to the fields at Maryvale for the first day of Spring Training. Although he didn’t seem to be hurt in any way, the tiny doggie was covered in what appeared to be grease from contact with car tires. Had he been hit by a car? Who would take care of this poor little pupper? 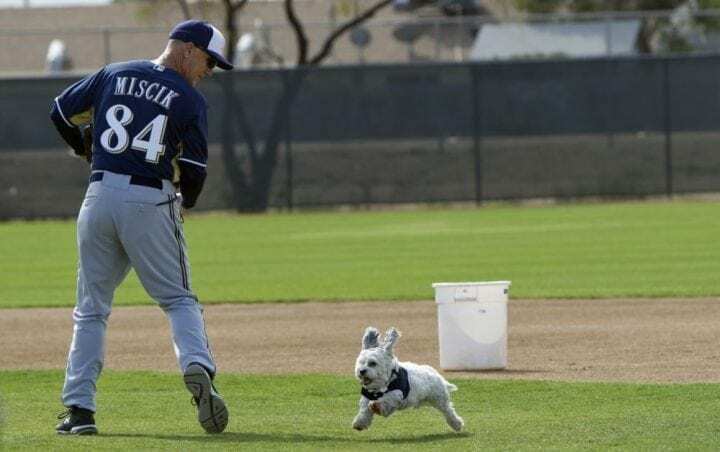 Brewers third-base coach Ed Sedar, heading out toward the playing fields on this first day for pitchers and catchers to being their workouts and bullpen sessions, came upon this scene at the security gate and his doggo instincts kicked into gear. Sedar was well-known for his love of all things canine, he even had a rescue dog of his own at home. What Sedar didn’t know – what no one knew that sunny February morning – was that he was about to make the biggest rescue in Milwaukee history and change the Brewers’ family and fandom forever. 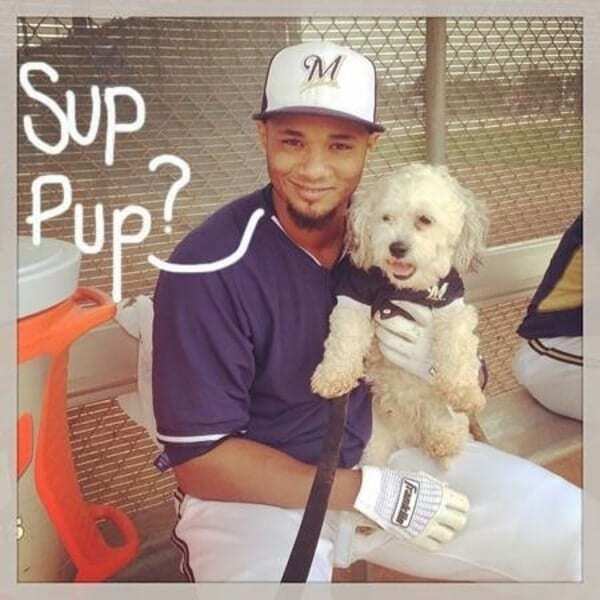 Sedar gathered up the fluffy, if bedraggled pup, and brought him into the Brewers’ clubhouse. After a quick once-over to assess any serious injuries, Sedar determined the tiny pup was ok, if not scared and in need of a good meal – and maybe a bath. The meal would come first, as Sedar treated his new-found friend to sausage and eggs from the team’s breakfast spread. The little dog, undoubtably a stray always searching for his next meal, happily accepted this scrumptious offering. While the pup gathered his strength, he also started gathering a crowd. 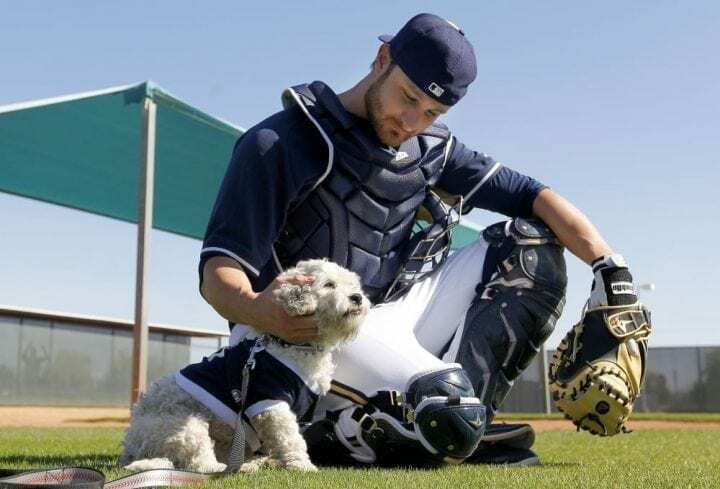 Pitchers like Yovani Gallardo and Brandon Kintzler and catchers like Jonathan Lucroy were making their way into the clubhouse for the first day of workouts, and couldn’t help but notice the ball of fluff and energy that Sedar was looking after. As would be the case throughout his life, the little name-less dog charmed all who encountered him on first meeting, and the players quickly decided that this little guy belonged in their care. But what about a name? Having determined he was a boy, the team settled upon a name that was pure Brewers. They decided to call him Hank, named after the greatest slugger in Brewers history, if not all of baseball: Hank Aaron. 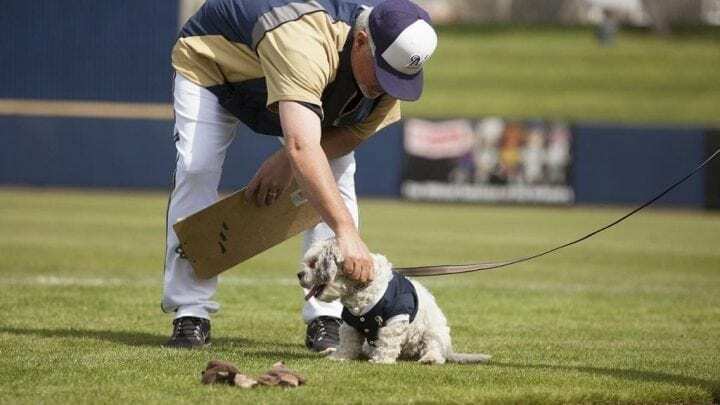 The four-legged version had no chance of coming close to Aaron’s 755 career homers, but with his speed and fetch skills, Hank would have made a fine defensive replacement, and he showed his skills each day in the field. But, still, despite his happy attitude and agility, the team decided Hank needed to see a doctor to check on what appeared to be minor injuries to his tail and back legs, likely the result of the hit-and-run. 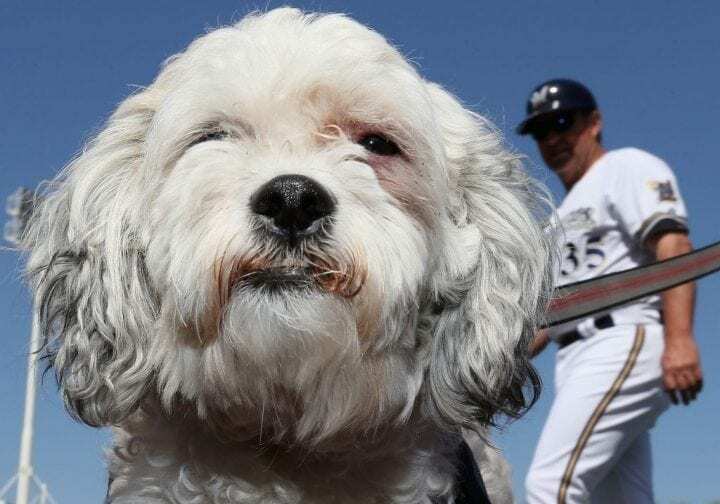 But a local vet gave Hank a clean bill of health and also determined that the Brewers’ new buddy was likely 2-years-old and a Bichon Frise mix. So it was back to the complex in Maryvale, where the team huddled up to figure out the next course of action. Surely this dog had actual owners, the team surmised, so team vice president of communications Tyler Barnes thought of ways to make the local citizenry aware of their find, should anyone be looking for him. That meant giving Hank a little media exposure, first on Twitter, Facebook and Instagram. And boy, was Hank a natural media hound. 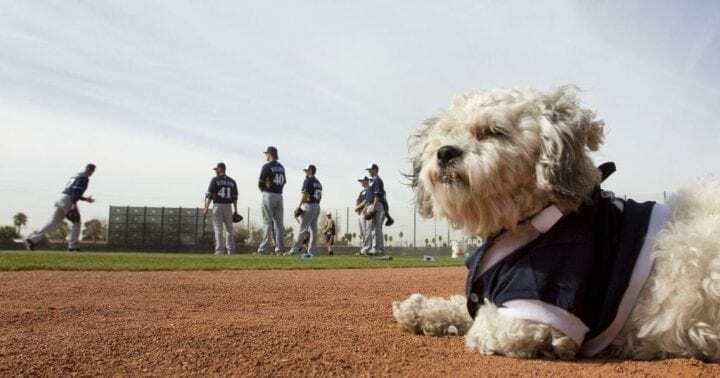 The players, who were taking turns bringing Hank home with them at night for food, shelter and belly rubs, now let Hank take part in infield and outfield drills, always well within sight of reporters, photographers and TV news teams. Hank was given his own Brewers jersey – he was originally assigned the No. 1 — and the little guy wasted no time getting acclimated to life on the diamond. Imagine PFP drills (pitchers fielding practice) with a P-U-P! And while that plan of action did not result in any local owners coming forward, it created a situation where virtually anyone who saw this little doggo running around the field and flashing his big smile wanted to adopt him immediately. 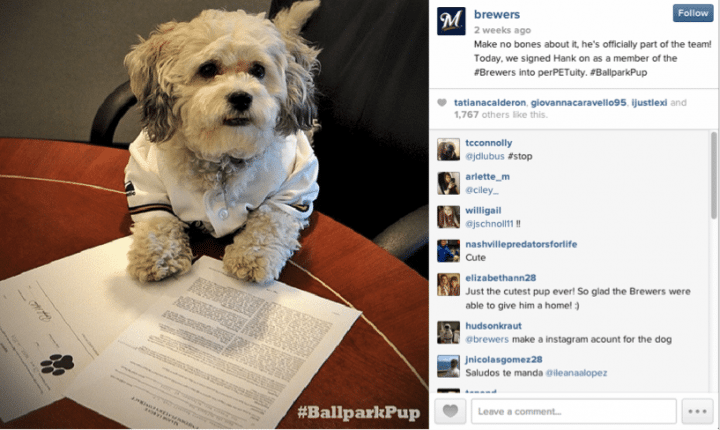 As the Brewers put pictures of Hank on their social media accounts, the outpouring of love was immediate – and far-reaching. Sure enough, the social media explosion led to frenzy among traditional media. 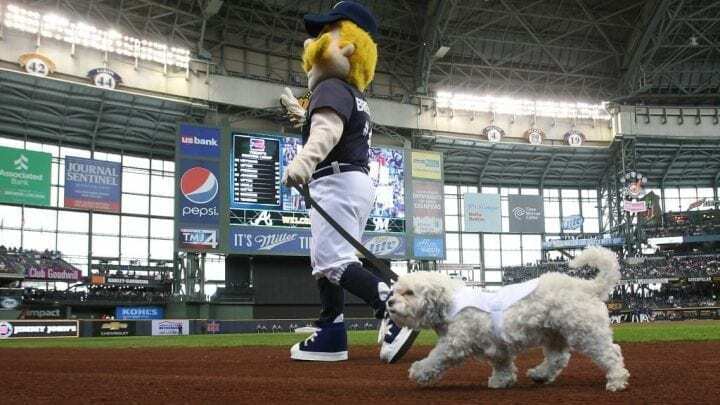 The Milwaukee Journal-Sentinel started running daily Hank updates on its website. People Magazine came to Maryvale to do a feature story. Good Morning America and the Today Show wanted in on the puppy love. 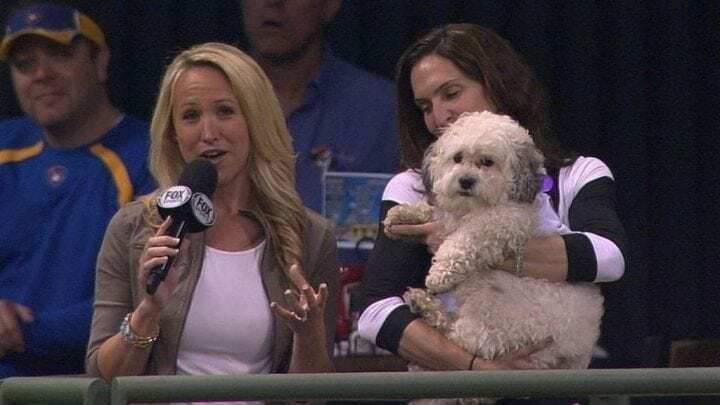 Even The Tonight Show called to request a live, in-studio appearance with Hank the Ballpark Pup. “I’m second banana now,” tweeted Brewers’ broadcaster Bob Uecker, a long-time Tonight Show guest. Hank-Mania was now a very real thing, and the Brewers, led by Barnes, knew they had a hit on their hands. The team rushed Hank merchandise — primarily a T-shirt with a cartoon likeness of Hank on the front – into their Spring Training stores. They gave fans the chance to have their picture taken with the people-friendly pup. Hank channeled his inner-Lab and happily soaked up all the attention while melting hearts all over snowy Wisconsin. 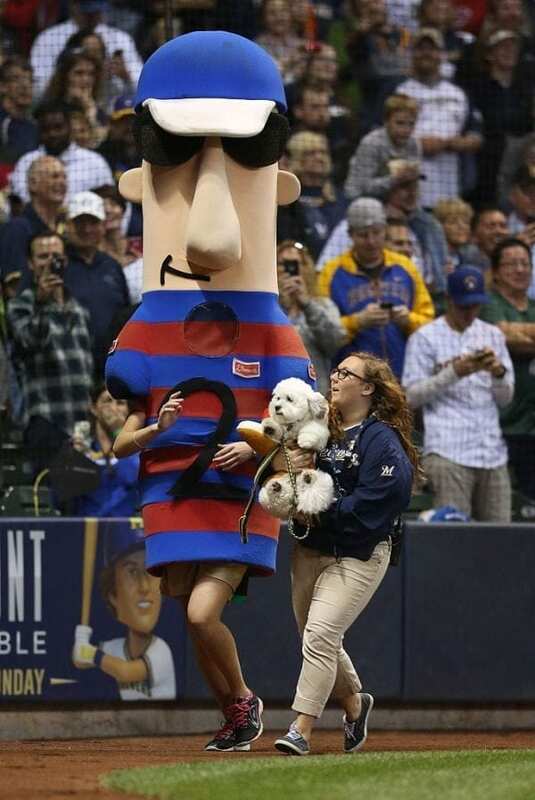 The Brewers even dressed Hank up in a hot-dog costume and had him run a practice race with the famous Racing Sausages! Only Hank could turn a sausage race into an opportunity to ham it up for the cameras. Hank took to racing with the same energy and enthusiasm as his infield exploits, using his extra set of legs to keep up with the big beefs. 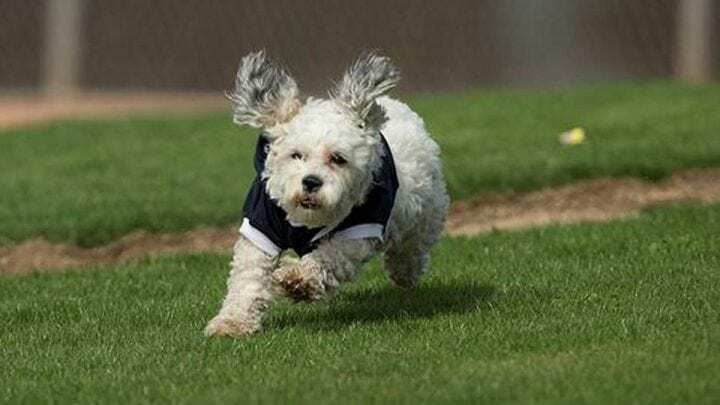 The Brewers put the video of the super-cute practice race on social media and the Hank frenzy only increased in size and intensity. 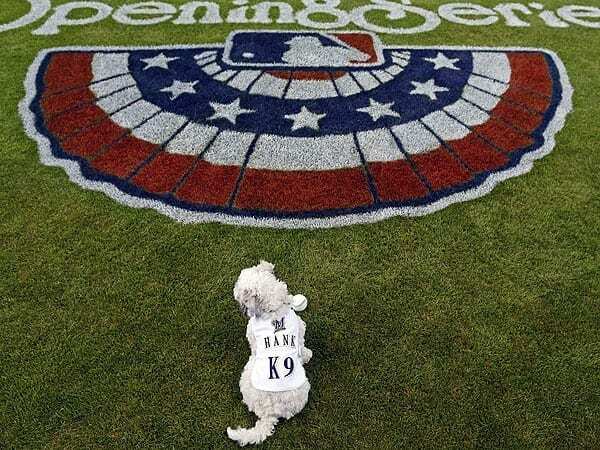 Then the team made the inevitable official, signing Hank to a lifetime contract, with Melvin presiding, and giving Hank the Ballpark Pup his own uniform and number: K9. Ah, but who would be that family? That question was being answered behind the scenes in the Brewers’ front office. It would be the team’s legal counsel, Marti Wronski, who would welcome Hank into his forever home. 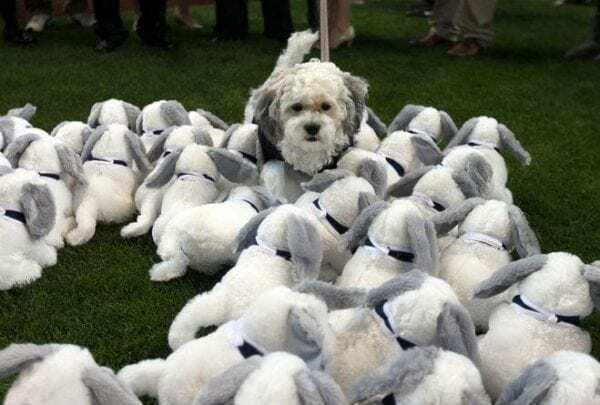 The team had inquired with Wronski about the legality of adopting Hank in the earliest days, when it was assumed a real owner was looking for their lost fluff-ball. What happened can only be described as Hank-Mania. Almost 50 years to the date that four long-haired lads walked off an airplane in New York and took America by storm, a short-haired fellow was about to have the same experience in Milwaukee. 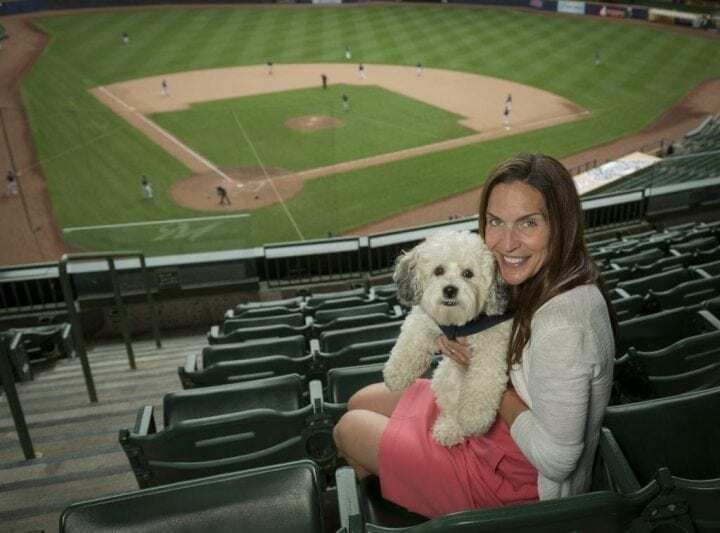 In late March, with Spring Training winding down and Opening Day at Miller Park fast approaching, it was decided that Hank would live with the Wronski family in Wisconsin. So it was arranged – and announced – that Hank would be flying back to Milwaukee ahead of the team. 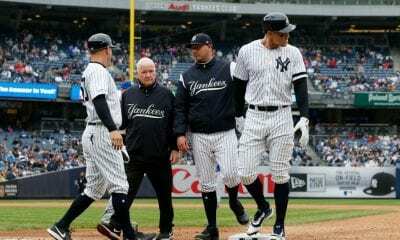 There was the matter of getting him acclimated to his new permanent home and climate – and also a pre-planned stint on the disabled list after a certain surgical procedure at the vet. 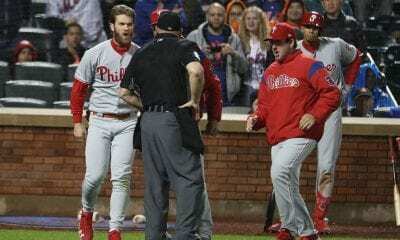 Let’s just say that never again would Hank have a baseball count of 2-and-0. But it wasn’t all bad for the doggo. When his plane landed at the airport in Milwaukee, Hank was officially greeted by hundreds of adoring fans, including the Mayor of Milwaukee. But where Hank really made his mark was in charity work. Hank was lucky to be rescued by the Brewers and find a forever home. Now, with the Brewers’ help, he was ready to give back. Hank merchandise was already a huge hit in Maryvale, with portions of the proceeds going to the Arizona Humane Society to fund stray animal care. But now that he was in Milwaukee, Hank merchandise took on a life of its own. 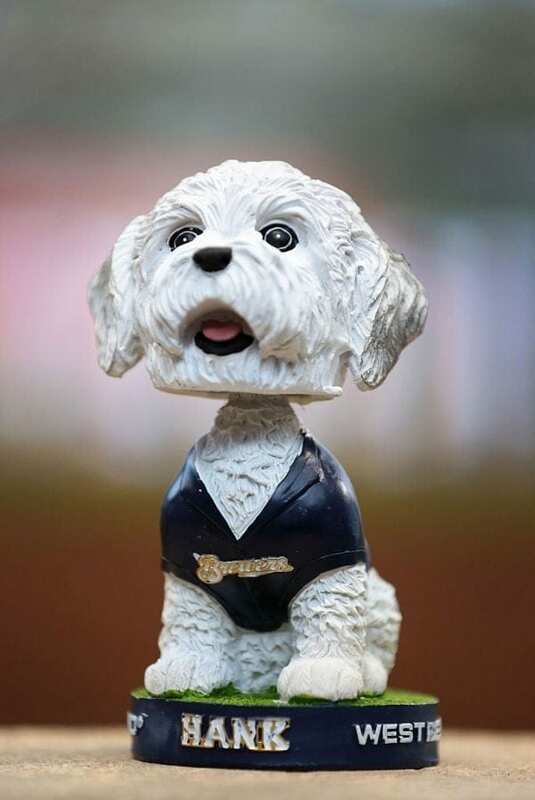 T-shirts, hats, plush toys, framed photos, a children’s book, even a planned “BobbleHank” night for September 13 that season, to coincide with Wisconsin Humane Society Day. 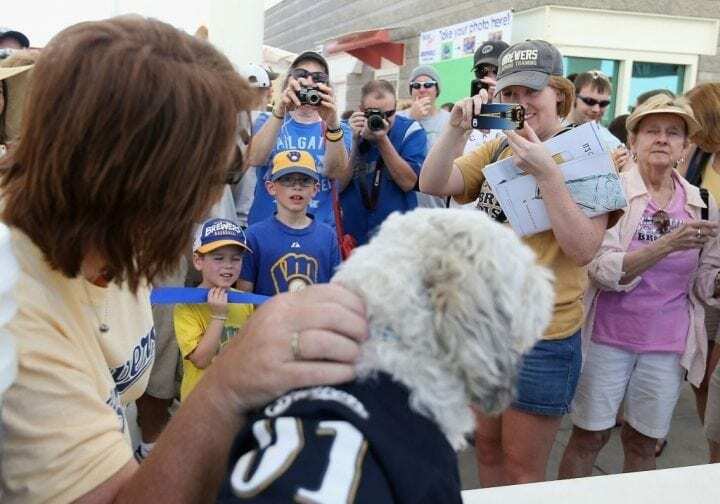 The Brewers flooded the zone with Hank items, and donated 20 percent of the proceeds from Hank shirts, baseballs, hats and other items to the Wisconsin Humane Society. 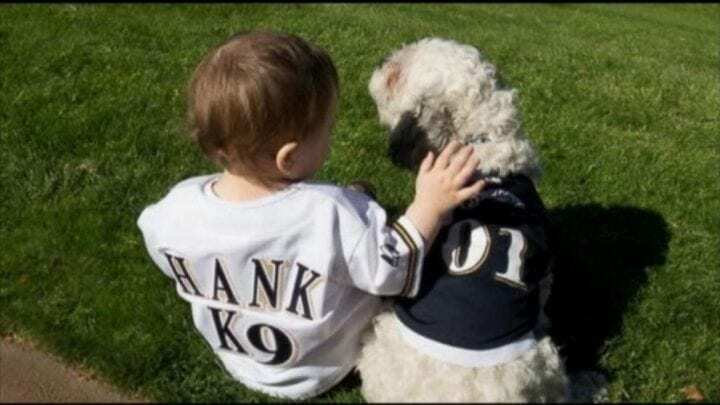 By early June, the Hank t-shirt that debuted in Spring Training had become the single-biggest seller in Brewers’ history and close to $150,000 had been raised, as well as awareness of the need for rescue homes. Turnout for the Wisconsin Humane Society’s annual dog walk doubled after Hank became involved in its promotion, and the Society had one of its busiest years ever in terms of adoptions. Speed said much of the money that Hank helped raise would go toward a high-volume, low-cost spay and neuter clinic. Back at Miller Park, the Hank phenomenon was showing no signs of slowing down. 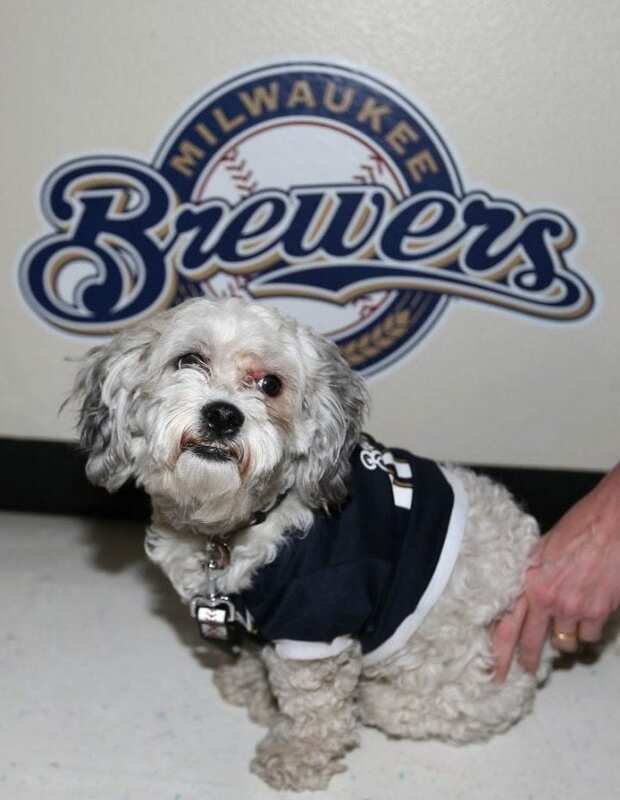 After appearing at Opening Day, the Brewers realized Hank needed his own space at the ballpark, where he would appear at roughly 20 of the team’s 81 home games, posing for pictures with adoring fans. 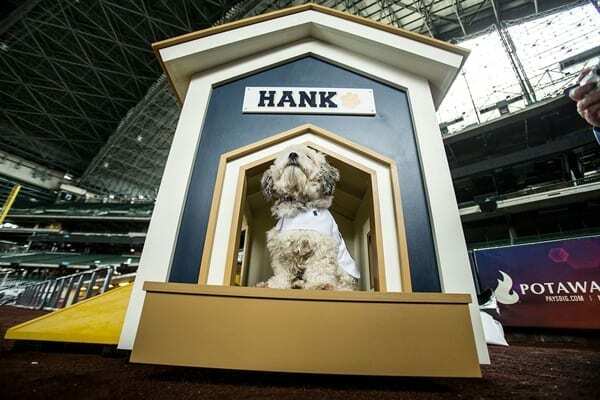 The team even built Hank his own tricked-out doghouse, which was placed on the concourse level. The house even featured it’s own yellow slide on the side, in tribute to Bernie The Brewer, who goes down a giant yellow slide after every Brewers home run. 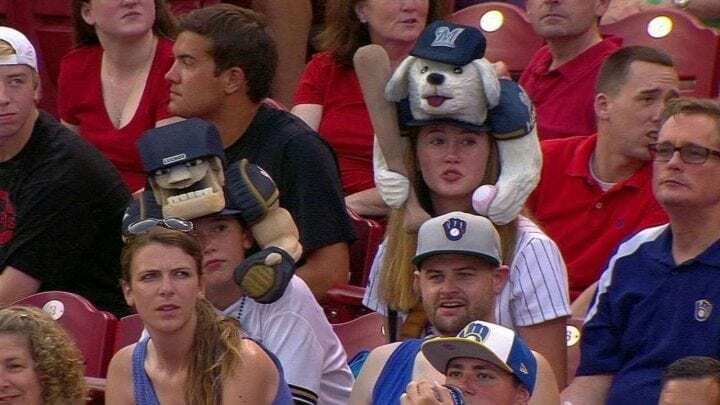 And speaking of Brewers home runs, in August that season, the Brewers blew everyone’s mind with a single photo, posing Hank the Ballpark Pup with Hammerin’ Hank himself. 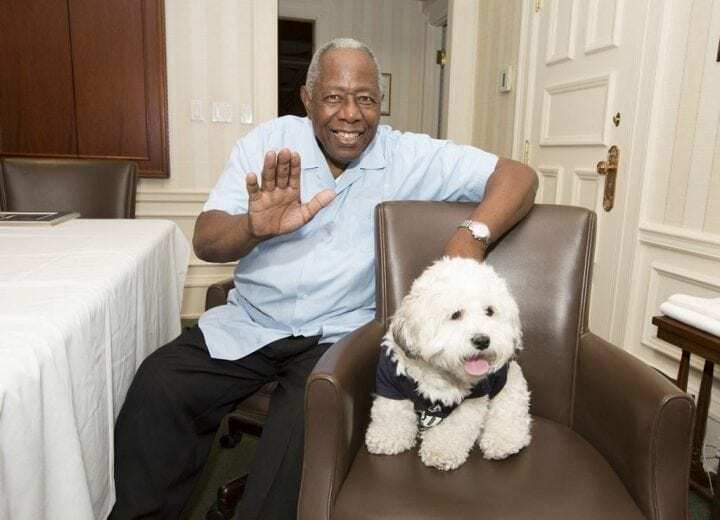 Hank Aaron knows a home run when he sees one, and he couldn’t have been happier to meet his namesake. This magical meeting of the Hanks only added to the doggo’s mystique. A month later, Hank reached the pinnacle in baseball: He got his own bobblehead doll. 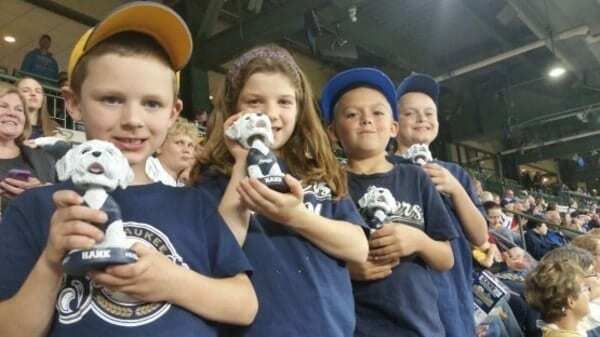 The “BobbleHank” led to one of the only Brewers’ sellouts all season. 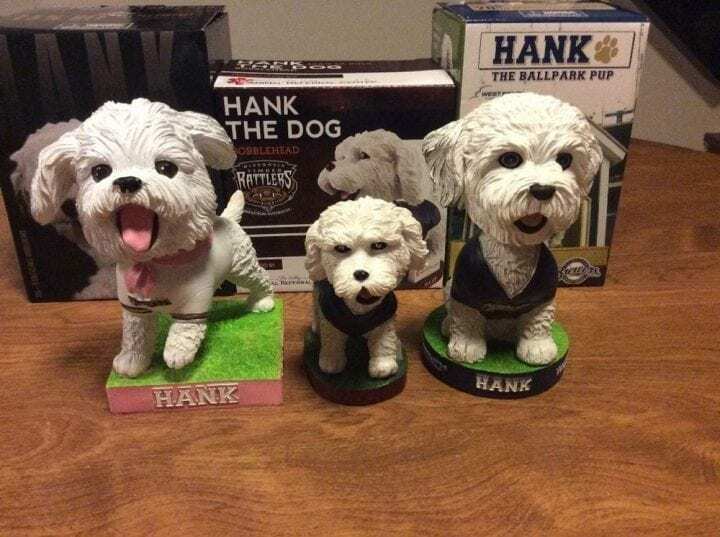 Not only did fans get their own BobbleHank by coming to the game on Sept. 13, 2014, those in attendance were treated the Hank-iest Hank moment of the entire season. 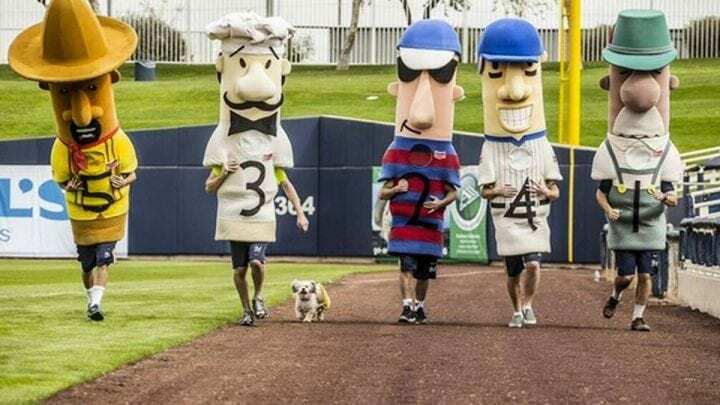 The team marked the occasion by following through on a Spring Training idea: They let Hank run in the famous Sausage Race. 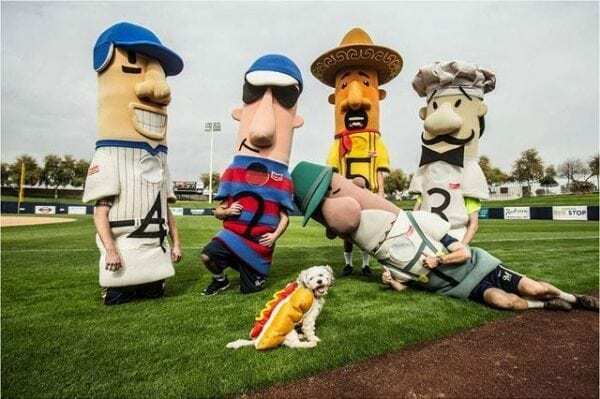 Alongside Brat, Polish, Italian, Hot Dog and Chorizo, Hank donned his hot-dog costume once more. Hank took his place at the starting line alongside his tasty teammates as the crowd rose in anticipation of this once-in-a-lifetime (even in dog years) moment. But this day, amid all the pomp and circumstance, little Hank just wasn’t feeling it. The Sausages took off on cue, but Hank stayed back, eventually scooped up in a human’s arms and run around the field. Must not have been in his contract! 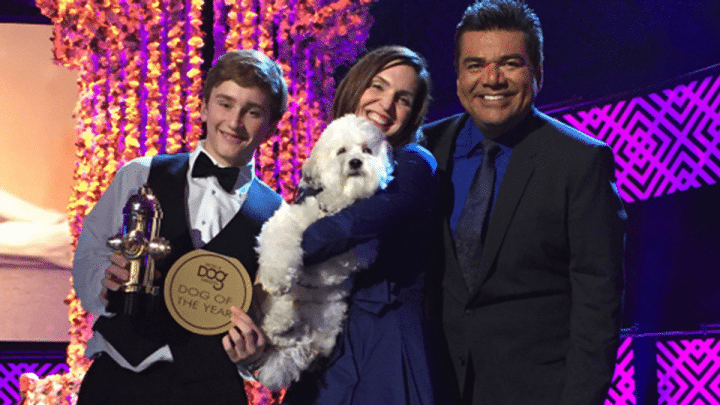 But that mishap did not diminish Hank’s hold on the public consciousness, and after baseball season was over, Hank received the highest award a canine can receive, named Dog of the Year on a nationally-televised World Dog Awards show. Appearing in the contest hosted by Paris Hilton and George Lopez, Hank, dressed in a tuxedo, had truly made it big time. Even as Hank’s public appearances began to be scaled back in 2015 – Hank did not return to Spring Training in Maryvale – the interest in all things Hank continued unabated. For his second season, there was a new Bobblehead, this one timed for release on Mother’s Day, with Hank adorned in a pink bandanna to help raise awareness for breast cancer detection and treatment. “The demand for product is just to the point now where it’s not really slipping, and he’s worthy of his own store,” Brewers chief operating officer Rick Schlesinger said. “We keep coming up with different items of merchandise. You would think it would slow down in a year, but the volume of requests we get locally and nationally for Hank is not slowing at all. 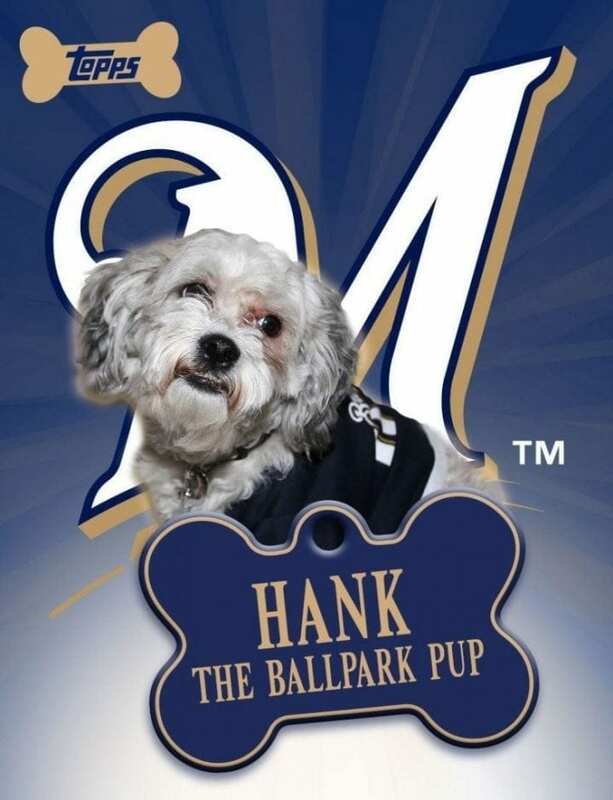 By 2018, the Brewers set the amount of money raised for dog-related charities from Hank merchandise at over $500,000. 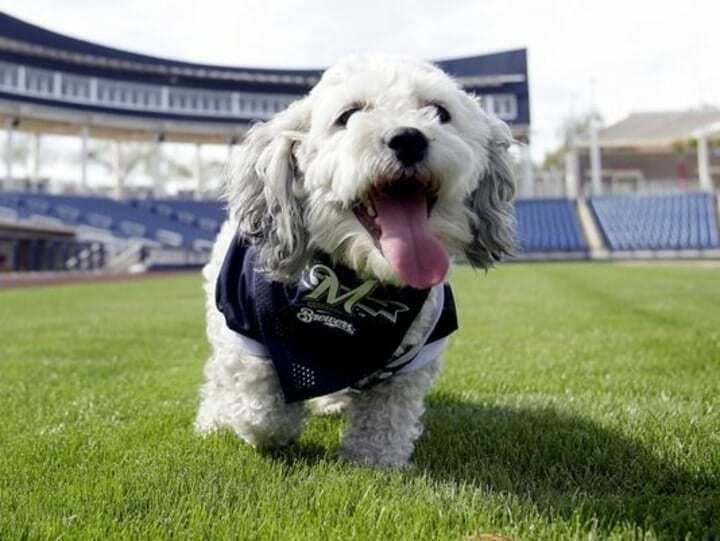 But like any celebrity who gets a little too much pup-arazzi, rumors began to swirl that something wasn’t quite right with the Ballpark Pup. 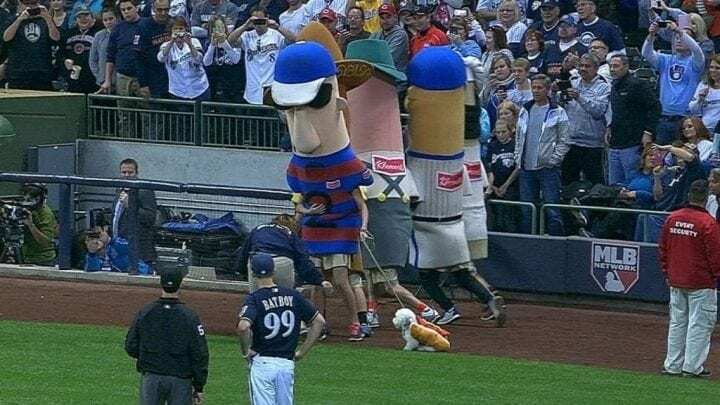 In early 2016, there was a website dedicated to the conspiracy theory that the Hank that was seen around the park and at public events in 2015 was not the same dog the Brewers had rescued a year earlier. Had the original Hank left Miller Park for the Rainbow Bridge? Was the new “Hank” nothing but an imposter? Never fear, Hank fans. 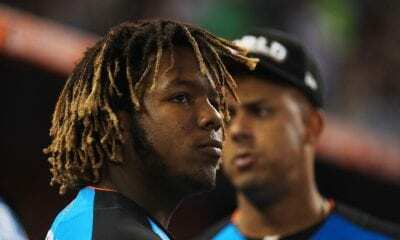 The Brewers put the rumors to rest during Spring Training. Flanked by vets with Hank’s medical records and microchip information – public service announcement: get your dogs microchipped! — Schlesinger held a press conference to announce that the Hank of March 2016 was the same as Hank 2014. 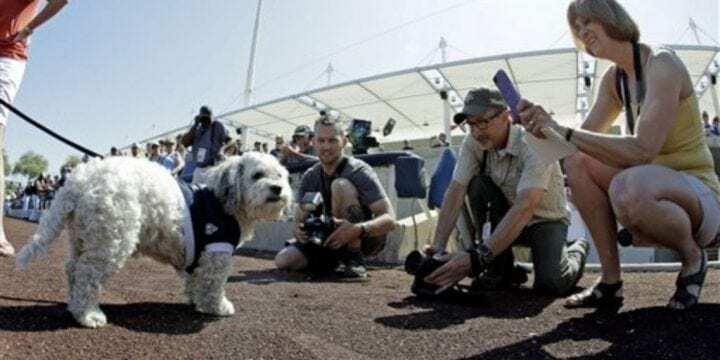 Yes, the Brewers held an actual press conference to prove the identity of a doggo.